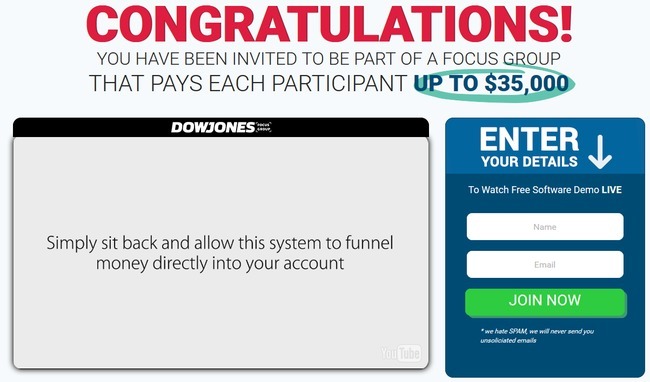 Dow Jones Focus Group found at dowjonesfocusgroup.com invites you to make easy money with their Equinox trading software. Don’t give your information away just yet, because Dow Jones Focus Group is a scam. Discover the hidden truth in our Dow Jones Focus Group review. Is there such thing as free money in this world? I don’t think so. The Dow Jones Focus Group scam is an automated binary trading software disguised as a focus group. The alleged organizer of the focus group, Jeffery Richards claims that he has managed multiple focus groups, including the ones for Breaking Bad movie, Pepsi, and Angry Birds game. This time round, Jeffery Richards is organizing a focus group for Dow Jones Stock Market Index, who released a software called Equinox to the public. Equinox is said to make money for real investment bankers and traders on Wall Street for the past 10 years. With the public release, the first Dow Jones Focus Group was done in 2014 and generated $250,000 for its members in a short 45 days. So the second focus group will be opened for 90 days with the hope of doubling the results from 2014. While I gave him the benefit of doubt and tried to believe what he said in the sales video, my trust for him completely shattered when I found out the truth behind the scam. Towards the end of Dow Jones Focus Group’s sales video, Jeffery showed us the testimonials of a few participants from year 2014. All of them claimed to have made a respectable sum of money during their participation in the focus group. The profits of Dow Jones Focus Group members seem impressive..
Their results look very impressive for someone who has just used the software for a short 45 days during the focus group. Coupled with their testimonial videos, it certainly looked quite legitimate. Well, it was impressive until I found out the true identity of these Dow Jones Focus Group “members”. ..too bad they are just Fiverr actresses giving fake testimonials. The raving testimonials of Dow Jones Focus Group “members” are actually fake testimonials given by professional Fiverr actresses, or presenters. 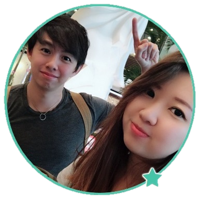 They offer to read any script like a real testimonial for their clients. This gig description is given by one of the Fiverr actresses used by Dow Jones Focus Group scam. Generally, a fake testimonial can be bought at $5 at Fiverr.com. This is called buying a testimonial. You can now secure your wallet and read on if you want to know how the scam works, and how it attempted to make money off you. I think it’s mandatory to side track a bit and talk about binary trading because this is a binary trading software scam, after all. Binary trading is basically trading stripped down to its simplest form. You don’t have to analyze financial charts or keep up with the financial news. Instead, you only need to guess if the price of an asset will rise or fall after a short period of time, usually between 30 seconds to minutes. This is how it works – let’s say I feel that the exchange rate of EURUSD will drop 3 minutes from now. I bet $50 on a 3-minutes contract. When the time is up, and the market is indeed lower, I win a certain percentage of the amount I bet, usually between 60% to 80% ($30 to $40). But if I’m wrong, I lose my entire of $50. In reality, guessing the result of binary options is the same as guessing the outcome of a coin toss. There’s no way to predict the market movement in such a short period of time. In most cases, traders are facing the odds of 50-50 in their bets. Even if you manage a 50% win rate, you’ll still lose money due to the uneven winning vs losing payout of binary options. Back to Dow Jones Focus Group scam. Jeffery Richards claims that the Equinox software he’s promoting is an easy to use, point and click software. And that part is true, it is indeed very easy to use. You just have to sign up for a broker account, deposit money, and activate the software. But what Jeffery didn’t tell you is that using the software isn’t exactly risk free. In the contrary, it’s all about taking massive risks on your money in a trading game that works against you. Equinox is a binary trading software that trades on your behalf. Jeffery uses words like “massive profits” and “free” to give you the impression that using the software is risk-free. It’s stated in the disclaimer that investing in financial instruments (binary options in this case) involves high degree of risk. Dow Jones Focus Group and its officials are not responsible for any losses related to use of its services or software. These terms are not included as a fair warning for you. 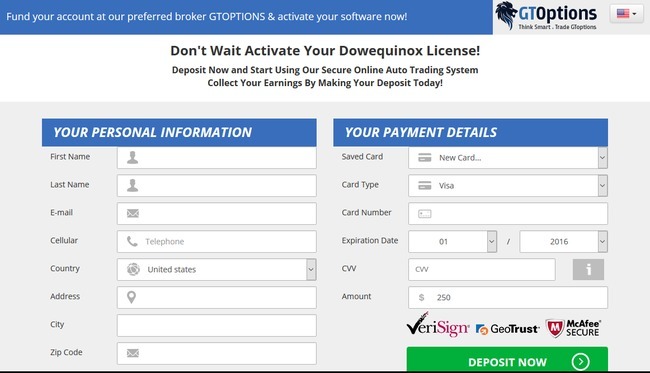 The sole purpose is to protect the scammers from legal actions when you lose all your money using their Equinox trading software. If they wanted to be honest about the risks of trading binary options using their software, they would’ve warned you in the sales materials. Instead, they chose to present to you fabricated earnings and fake testimonials. 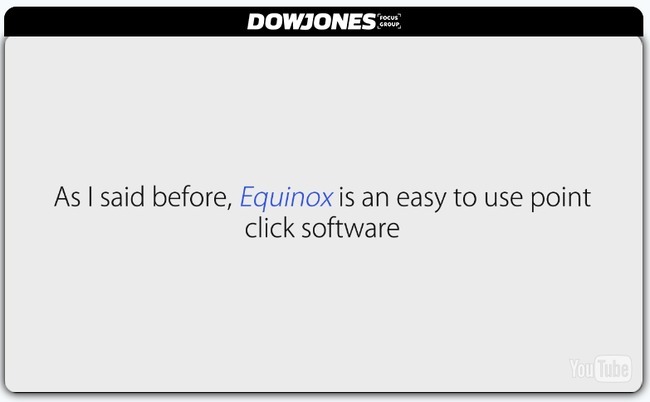 If you decide to join Dow Jones Focus Group and use their Equinox trading software, you’ll have to register for a trading account through their sales pages (which is an affiliate link). The scammers will earn a sum of referral fees as soon as you make your first deposit into the account. You may be assigned to different brokers depending on your country and location, but the minimum deposit for most brokers is $250. You can only use Equinox software with their recommended brokers. Even if you already have an account with one of their recommended brokers, you have to register for a new one using a different email address. This is because the scammers behind Dow Jones Focus Group cannot collect their referral fees if you don’t sign up through their affiliate link. And what happens when you finally deposit the money and lose all your money using Equinox automated software? You are left on your own and you cannot take any legal actions against the scammers, because it is already stated in the disclaimer that they are not responsible for your decisions. Is Dow Jones Focus Group a Scam? YES, DOW JONES FOCUS GROUP IS A SCAM. As we’ve said in the review earlier, we don’t recommend binary options trading as a way to make money online, at all. It’s not that different from gambling, and using an automated trading software is no different. You are essentially putting your hopes and entire investment in a piece of software that gambles on your behalf. Yes I have been scammed by L binary broker after 3 years trading they disappeared with all clients accounts including mine , let me know if you know the location of the CEO Mark Hammond or senior manager Michele Zapos.